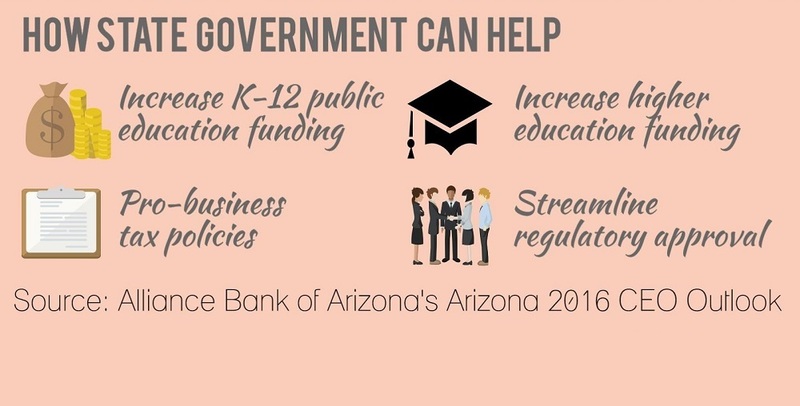 What will the Arizona Legislature’s Fiscal Year 2019 budget and the key bills that were approved this session mean for K-12 public schools during the next school year? Education advocates main goals this year were to secure additional district additional assistance funding, protect the 1.06 percent teacher pay stipend and move it into base level funding, and seek additional building renewal funding, said Chris Kotterman, governmental relations director for Arizona School Boards Association. “Obviously, all those things did happen and then some,” Kotterman said during a recent Legislative Wrap-Up webinar. Of the $188.9 million in required formula adjustments included $84 million for enrollment growth and $104.9 million for the 1.8 percent inflation cost increase in base level funding, Kotterman said. 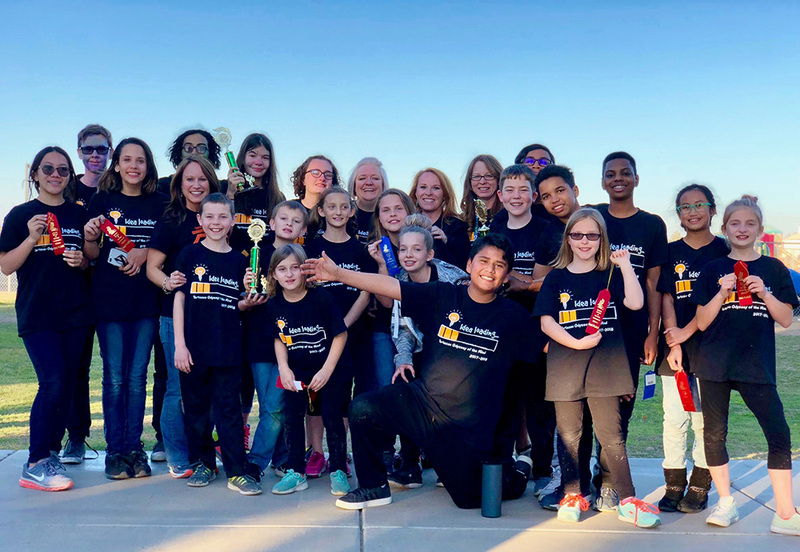 “A lot of the growth would actually be in charter schools (enrollment),” said Chuck Essigs, director of government relations for Arizona Association of School Business Officials. There is $1.8 million in the budget to fund Joint Technical Education Districts, Kotterman said. 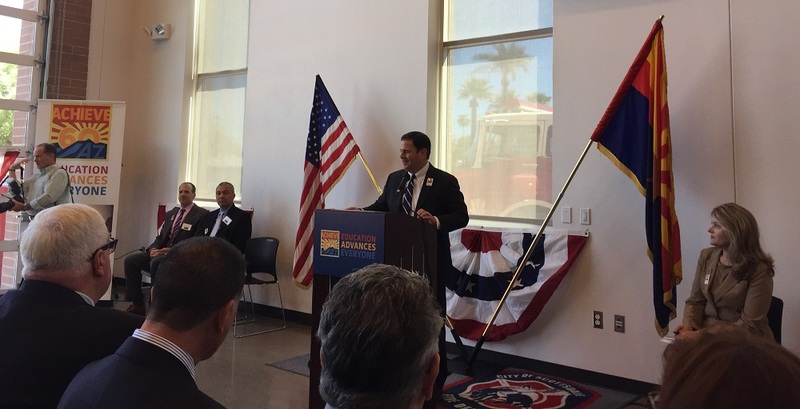 “Everyone else except for East Valley Institute of Technology and maybe West-MEC and maybe Pima County JTED was funded at 100 percent, but those three are now going to get 100% formula funding as well,” Kotterman said. Of the $51.1 million in building renewal grants, $16.7 million is ongoing funding and $34.4 million is one-time, Kotterman noted. 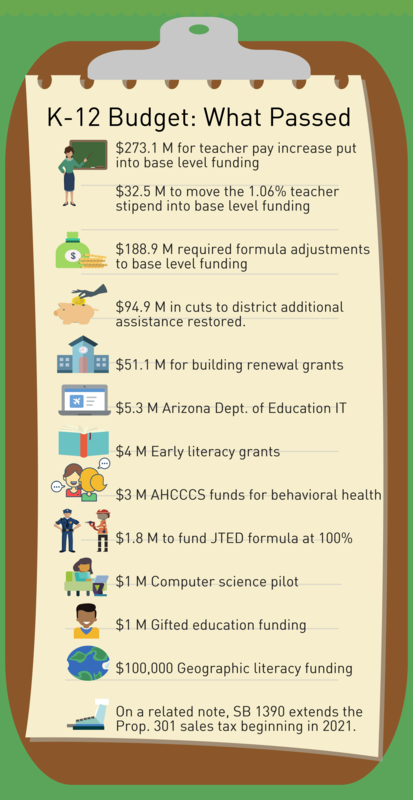 As part of Governor Doug Ducey’s school safety proposal there is $3 million in Arizona Health Care Cost Control System funding that will enable school districts who bill Medicaid-eligible students for services to draw-down of additional federal funds for school behavioral health and estimates are between $10 to $12 million for that, Kotterman said. It will be up to the school district to determine if they bill sufficient fees that they can access that funding to add more counselors for students, Kotterman said. “It’s not a sort of flat distribution to school districts for counseling services. It’s an AHCCCS program,” Kotterman said. There are also several non-formula issues in the budget, including $4 million in additional funding for Early Literacy Grants that were enacted last year, $100,000 in Geographic Literacy Funding. $5.3 million for Arizona Department of Education’s IT system, $1 million for a computer science pilot program and $1 million in gifted funding, Kotterman said. About $95 million in the cuts to district additional assistance will be restored in fiscal year 2019 which begins a five-year phase down of the $352 million in cuts made to district additional assistance since fiscal year 2009, Essigs said. “In future years, that reduction will go down each of those years until you get to the point in fiscal year 2023 where there will be no cuts existing,” Essigs said. Districts with less than 1,100 students had their district additional assistance cuts limited to $5 million, and the fiscal 2019 budget will restore those cuts bringing those districts back to what their full DAA funding was in fiscal year 2019, Essigs said. District leaders need to carefully consider whether they want to use any of this restored district additional assistance for teacher compensation or other employees compensation, because “once you do it and put it in operations – it’s probably committed going forward, because your probably not going to be able to cut salaries to get that money back out,” Essigs said. “There’s going to be a lot of pressure to use that money for capital because of the unmet capital needs districts have, and there’s going to be a lot of pressure to use some of that money to compensate employees in the district,” Essigs said. “What some districts have done over the years on the Capital Outlay Revenue Limit allocation is that they would have formulas saying we’re going to take X amount of the money that we get and we’ll use that for operational expenses, and we’ll use X percent for capital expenses. At least so you have something to guide you,” Essigs said. Legislators put $273.1 for the teacher pay increase into base level funding and shifted the $32.5 M from last year’s teacher 1.06 percent teacher stipend into the base level, which means a total increase to the base-level of approximately $306 million, Kotterman said. Moving this money for teacher pay into base level funding was important because “once it gets into the base level, the legislature has to continue that and they have to provide an annual inflation increase to it,” Essigs said. “This legislation does not limit who you can give increases too, it’s just only looking at the specifics of who you decide is a teacher and how you are using the monies that are being distributed through that $306 M to provide increases,” Essigs said. The Office of the Auditor General will provide a space for salary reporting on fiscal year 2019 budget forms that will include the average salary for teachers in FY 2018 and 2019, the increase in average teacher salary from the prior year, the percentage increase and a space for comments, Essigs said. All district and charter schools will include this on their budgets, and the Arizona Department of Education by Nov. 30th will have to issue a report, Essigs said. Everyone is going to be looking at this to see what school districts do with the funds for the teacher pay increase that were added to base level funding, Essigs said. “That report will probably get the same kind of scrutiny that the classroom spending report from the Auditor General’s Office does that they put out in March of each year, because people are going to want to know what was the average increase in teacher salary across the state, what was it in districts, what was it in charters?,” Essigs said. During the 2018 session, 238 bills were introduced that impacted K-12 public education, but by the end of session there were just 74 that were left and viable and “when the smoke cleared, 48 bills affecting K-12 – not including the budget – were signed into law,” Kotterman said. Among the key bills was SB 1390 sponsored by Sen. Kate Brophy McGee which essentially renewed Prop. 301, a six-tenths of a percent sales tax that public schools rely on when creating their budgets which expires Jan. 1, 2021 for another 20 years, Kotterman said. Prop. 301 requires that 20 percent of the sales tax revenues go to teachers’ base pay, 40 percent to teachers’ performance pay and 40 percent goes to a site fund that can be used for classroom needs, maintenance and operation. Prop. 301 also requires the legislature to increase per student base level funding annually by the rate of inflation for 2 percent, whichever is less. “It’s a different tax technically, but there won’t be any difference in collection in revenue, because it will continue as if it never stopped,” Kotterman said. The bill has an identical distribution of sales tax revenues as Prop. 301 except for one change, and that is that it redirects the $64 M that has been going to pay for revenue bonds at the School Facilities Board which will soon be paid for completely, to the Classroom Site Fund beginning in FY 2022. SB 1291 came from school districts’ frustration with the Arizona Department of Education reticence to share data and students’ AzMERIT results based on some concerns, Kotterman said. The bill was effective immediately after it was signed by the Governor. Once AzMERIT results are available – probably after Aug. 3 – school districts can request data from the Arizona Department of Education, Kotterman said. 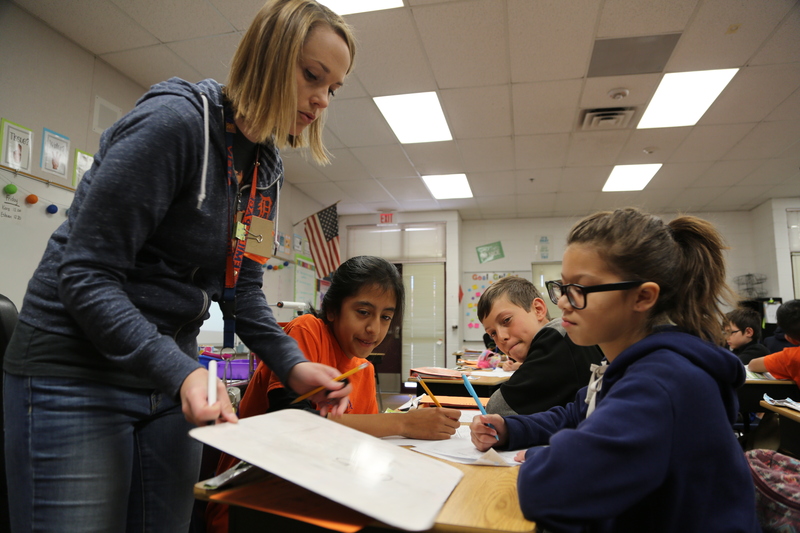 HB 2036 lets a long-term substitute teacher use that time spent leading classroom instruction toward their student teaching requirement if they’re pursuing a standard certificate, Kotterman said. HB 2065 provides penalties for violating the open meeting laws through electronic communications. In the fall, there was a big public push by business and community leaders to get full-day kindergarten funded, but that and didn’t come to fruition, Kotterman said. This bill, SB 1082, says that if districts offer an all-day kindergarten program that they need to meet or exceed the academic standards set by the State Board of Education, that it must be academically meaningful and that it must provide active learning enrichment, Kotterman said. SB 1083, which has been the source of a lot of conflict this year, was signed, said Leigh Jensen, governmental relations associate for Arizona School Boards Association. This bill requires school districts and charter schools to offer two recess periods a day for students in kindergarten through fifth grade, Jensen said. SB 1008 lets elementary school districts count all the time a student is at school as instructional time. In 2017, legislators modified the definition for high school which basically says that all the time that a student is required to be at high school counts for the minimum time requirement, Essigs said. “They basically have mirrored that same type of concept for elementary schools in SB 1008 – that you can count all the time that a student is at school as meeting the minimum time that is required for full state funding,” Essigs said. HB 2185 gives school districts some flexibility in rate levey to correct prior year issues in the property tax roll, instead of the current requirement that the levy be a fixed calculation.